Uncle Tony's Kebabs was an independent specialty fast food retail franchise in Australia that traded from 1983 to 2007 at up to 22 outlets. Its brand identity was phased out in 2008  after being acquired in 2007 by Ali Baba Lebanese Cuisine. Bill Mansour and his sister Rita founded Uncle Tony's Kebabs in Queensland in 1983. A second location was added in 1986, licensed sale of their products through other take-away outlets started in 1988 and franchising commenced in 1992. Bill's son Mark Mansour joined the business in 1994 and introduced computerised accounting and distribution systems. In 1997 Mark Mansour bacame Chief Financial Officer and in 2000 took over as Chief Executive after the retirement of the founders. Most Uncle Tony's Kebabs franchises were located in Queensland, with a small number in Northern Territory and New South Wales. In November 2007 Uncle Tony's Kebabs was acquired by Ali Baba, a competitor based in New South Wales. Voted as the best kebab outlet on the Gold Coast (The Gold Coast Bulletin). Recognised as the Healthiest Fast Food Alternative in a special “healthy feature” aired by television current affairs programme Today Tonight. 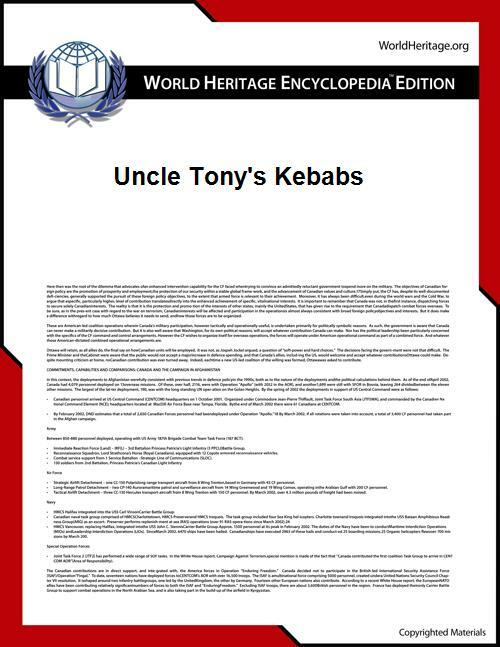 ^ "UNCLE TONY'S KEBABS THE BEST...MATE! UNCLE TONY - 530248". Intellectual Property in Australia. ipaustralia.com.au. Retrieved 31 October 2014.